More people are speaking Inuktitut in Nunavut. That’s according to a Statistics Canada study on linguistic diversity, released Aug. 2, which found that from 2011 to 2016, the number of people speaking Inuktitut in Nunavut rose by 12.1 percent. 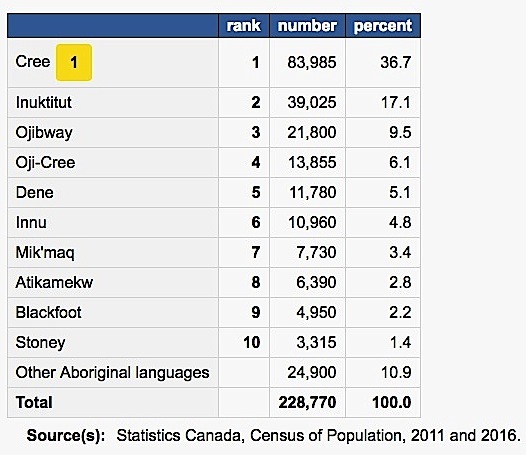 StatsCan found that Cree is the most commonly spoken Aboriginal language at home. The 2016 census, which provided data on close to 70 Aboriginal languages, found 83,985 people in Canada spoke Cree languages. Inuktitut — the second-most spoken Aboriginal language — was spoken by 39,025 people, while 21,800 people spoke Ojibway, 13,855 people spoke Oji-Cree, 11,780 people spoke a Dene language and 10,960 people spoke Montagnais, the language of the Innu. “This difference, particularly significant among youths aged 0 to 14, shows the growing acquisition of an Aboriginal language as a second language,” StatsCan said. In this age group, 44,000 people have an Aboriginal language as a mother tongue, while 55,970 people speak an Aboriginal language at least on a regular basis at home. This increase suggests that in the future, more young Inuit may also learn Inuktitut as a second language, if they aren’t doing so already. Among other things, StatsCan also looked at the rates of people speaking “other languages” at homes in the territories. It found the number of people who reported speaking Tagalog, the main language of the Philippines, rose sharply in Yukon by 105.4 percent, in the Northwest Territories by 58.8 percent and in Nunavut by 54.5 percent. About 1 in 5 Canadians now speak more than one language at home, with that proportion increasing from 17.5 percent in 2011 to 19.4 percent in 2016. StatsCan found that in about half of Nunavut homes, more than one language is spoken. But English and French remain Canada’s main languages: 93.4 percent of Canadians speak either English or French on a regular basis at home. StatsCan says 4.3 percent of Nunavut residents speak both French and English, with French-speakers comprising a little less than 2 percent of the territory’s population.